A super-luxe backyard bash with a magical mood reminiscent of fairy gardens. 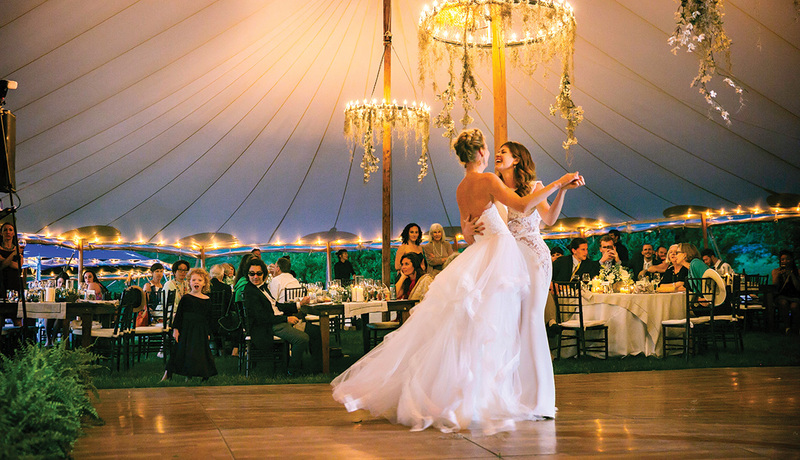 Alison Manning’s wedding to Alison Weaver was one part fairy tale, one part killer dance party, all parts super-luxe backyard bash. In other words, it was all Alison all the time. 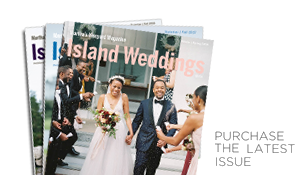 From the ceremony to the reception they made the event a true reflection of themselves and incorporated elements of their careers, their family, and the Island. The morning began with a torrential downpour, followed by a heavy fog that blanketed the property and blocked the view. But by 1 p.m. the clouds began to part. “At that moment,” said Weaver, “I remember feeling like it was meant to be.” The blue skies, rolling green hills, and shiny sea beyond made the perfect backdrop for their dreamy, mossy vision for their wedding. The pair tapped florist Marlene DiStefano of Island Ambiance to create lush table centerpieces using ferns, moss, white flowers, and mushrooms. Mini topiaries marked each place setting, and chandeliers inside the tent were draped with sparkling lights and branches. After dinner the kids settled into beanbag chairs and watched a movie on a projection screen while adults danced to music by The Sultans. Alison Manning is executive director of The Yard, a dance colony in Chilmark, so there were many professional dancers in attendance. The dancing, everyone agreed, was a highlight of the celebration. “Endless nights of music, poetry, dance, and painting have fueled our summers for years,” reminisced Weaver. Their wedding day was no different.